So, it's time for Keen 3 insane minimalism level collection (deadline extended to Nov 16th). Not a competition this time, although I guess we could poll people's favourite level just for fun. The main idea this time is to take advantage of the temporary invincibility provided by ankh (http://www.shikadi.net/keenwiki/Ankh). -Border is made of tile 245 only. So no hidden ankhs or solid tiles in border. 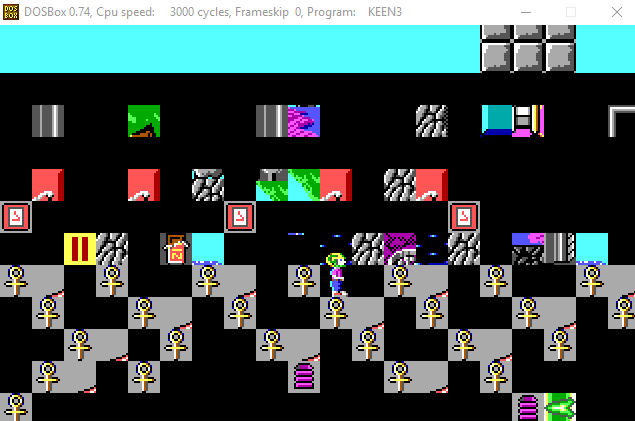 -Keen is allowed to fall out of level (which kills him, naturally). -Only one sprite, the Keen level entry sprite #255. -One exit per level. There must be an exit. -Use no other tiles than the ones mentioned in the list above. -Player has infinite Keens, pogo right from the start. -The ankh time is the normal ankh time, about 10 seconds per ankh, the way it is in the normal Keen 3 version 1.31. Send your level to KeenRush along with a name you want displayed in the credits. Simply attach the level file, don't bother zipping it unless your e-mail provider especially requires you to. Send your level to keenrushIQ at hotmail.com where IQ is replaced with Keen's IQ (314)! Don't post your level elsewhere! The collection of levels will be released after this is over and done. Only one level per Keener, but if you want to update your level or send an entirely new one, simply send that, and it will be used instead. Like in past insalevs, the purpose here is to showcase the styles and ideas of as many Keeners as possible. This is called InsaLev3 instead of InsaLevs3 so that it will fit in your 8-character DOS directories. Ahh cool! I will definitely be submitting a level! Aah I've been waiting for this! No ammo too I suppose? I hope Fleexy will set up a zip file with all the necessary things needed for this competition as the last time. Yes, no ammo implied because no sprites are allowed -- no purpose for shooting. Also, good luck with your levels guys. [...] I hope Fleexy will set up a zip file with all the necessary things needed for this competition as the last time. And I cannot test. The only thing I've changed in the level is the size to 200x150 and added a bunch of tiles as well. 200x150 is just too damn large. If I remember right, the maximum vorticons level size is about 16383 (x3FFF) tiles. Your level is 200*150=30000 tiles. Funny story, I actually started planning my level out some months ago, using a set of tiles that I thought would be most optimal. The design of my level was actually based on how those tiles looked together, and then you (KeenRush) ended up using the exact same set of tiles for the official thing! So that works out great! @proYorp: Cool. When one really thinks about the possible ones, these really are the obvious tiles. @Xrack: check your mail, there was a problem with the level file!